RICHMOND, Va. - Police cleared out a public park in downtown Richmond where members of Occupy Richmond have camped since October 15. Nine protesters were arrested. CBS Affiliate WTVR reports that police on foot and on horseback told Occupy Richmond demonstrators to leave Kanawha Plaza by 1:00 a.m. Monday morning, and less than an hour later went into the park and arrested those who refused to leave. Nine were charged with trespassing or obstructing justice. The occupation, inspired by the anti-Wall Street protests in lower Manhattan, had blossomed into a tent city, with dozens scattered around Kanawha Plaza in the city's financial district. The site also included a library, a volleyball net and a large blue tarp strung up on three magnolia trees. One of the protesters, Ira Birch, said the park was surrounded by a "huge line of cops" and police cruisers with their blue lights flashing. An officer read ordinances that the protesters were violating and told people to gather up their possessions and leave. She described the scene as "pretty peaceful." Birch gathered up her laptop, a modem and other belongings before she leaving, but many left tents, sleeping bags and other possessions, she said. "I actually left a tent there," she said. Later Monday morning, bulldozers scooped up items that were left behind, depositing the assorted tents, signs and debris into dump trucks. WTVR reports that once the cleanup is completed, Kanawha Plaza will be closed off with fences. "We started occupying with high hopes, and, unfortunately, this is what it came down to," said one protester. Mayor Dwight Jones met with Occupy Richmond protestors last week, and stressed the importance of following city laws which prohibit people from camping out in the park. "As Mayor of this city, I'm going to have to ensure that the laws of the city are enforced," Jones said last Thursday. Some members of the protest are standing nearby saying they will return. "Whether it be Kanahwa Plaza, whether it be on VCU's campus, whether it be on the sidewalks where we are now," one protester told WTVR. "Occupy doesn't have to be in a set location. The location of this doesn't matter; it's all in the heart." Birch said the police action had only strengthened the resolve of protesters, who have cited a litany of complaints but generally have targeted what they call corporate greed and income inequality. Activist filmmaker Michael Moore had tweeted the Richmond police action, which Birch said pleased protesters. About 30 protesters returned to the sidewalk at the edge of the plaza before noon Monday. They planned to rally at the VCU campus about one mile away and return to the plaza, they said. Letters of support boost Occupy Wall St.
Oakland, Calif.: Scott Olsen, the 24-year-old former Marine and Iraq War veteran who suffered a serious head injury during a police raid on an Occupy Oakland camp Tuesday, is expected to make a full recovery. Olsen's roommate Keith Shannon visited him on Sunday, and afterward told The Associated Press that Olsen still could not talk because of damage to the speech center of his brain, but said "he seems to be doing well." Doctors told Shannon they expect Olsen to make a full recovery. Olsen was moved over the weekend to a new medical facility, but neither Shannon nor officials at Highland Hospital where Olsen was first treated would say where that was, or give any further details on his condition or treatment. Oakland organizers said between 50 to 75 tents have been erected at the encampment since authorities allowed protesters to return to the site after it was cleared out earlier in the week. The city was maintaining a "minimal police presence" and fire inspectors would be inspecting the Occupy encampment daily, said Sue Piper, a spokeswoman for Oakland Mayor Jean Quan. A group calling itself members of the 1st Aid/Medics at Occupy Oakland announced that they planned to occupy the mayor's office in Oakland City Hall at noon on Monday. The group said in a statement that it was seeking the return of medical supplies that protesters said were seized by police during the raid of the encampment. Organizers have also called for a general strike on Wednesday, with a threat to shut down the Port of Oakland during the night shift. "It's another rallying call and an attempt to deepen the connection within the community and with the workers," said Kae. Michael Moore: Occupy movement "killed apathy"
Southern California: About 20 protesters were forced to leave Van Nuys Civic Center by nightfall as police enforced property rules that prevented tent set-up or trespassing after-hours. Demonstrators had said they would move to nearby streets but no protesters were seen Sunday. About 50 miles north of Los Angeles in the mostly rural Antelope Valley, protesters gathered Saturday in Lancaster ahead of a planned long-term encampment that organizer Angel Warner hoped would begin Nov. 5. The group was working on obtaining permits to set up outside Lancaster's city hall. Seattle, Wash.: Beginning Sunday evening, instructors at Seattle Community College campuses are teaching classes in support of Occupy Seattle. The classes are scheduled to be held in the plaza at Seattle Central Community College. They will focus on subjects such as legislative lobbying, the art of the protest sign, and filming to document human rights violations. According to Occupy Seattle and the Washington branch of the American Federation of Teachers, classes were scheduled throughout the night. Occupy Seattle is moving its month-long protest to the Seattle college campus. New Haven, Conn.: While most rode out the high winds and wet snow that came with the Autumn Nor'easter on Saturday indoors, Occupy New Haven protestors stayed in their tents on the green throughout the night. Protesters hunkered down for the storm, making sure their tents didn't get blown off. Despite the cold and wet weather, they are saying it is worth it to keep up the protest, and that it would take a little bit more than wet snow to make them quit. Niles, Mich.: Protesters inspired by the Occupy Wall Street movement have held a demonstration in the southwestern Michigan community of Niles. A rally on Oct. 12 drew about 100 people in Niles, and about 40 turned out for a follow-up protest Saturday. The South Bend Tribune in nearby South Bend, Ind., reported a number of drivers honked in support as they passed the people holding picket signs outside City Hall. Niles resident Conway held a sign reading, "Tax the 1%. We are the 99%." The 64-year-old computer programmer told the paper the U.S. has seen income redistribution favoring affluent people since the Reagan administration. The group Occupy Southwest Michigan has rallied elsewhere in Berrien County, including outside Republican U.S. Rep. Fred Upton's office in St. Joseph. 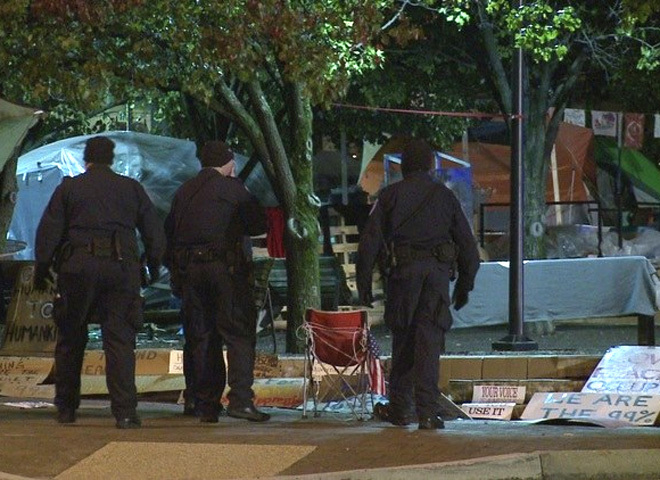 Rochester, N.Y.: Two Occupy Rochester protesters were ticketed Monday for violating city ordinances at a park where 32 demonstrators were rounded up on trespassing charges three nights earlier. One man was accused of violating Rochester's municipal code by affixing a sign to a Civil War monument in tiny Washington Square Park. Another was ticketed for sleeping in the park. Late Friday, 32 protesters were arrested for staying in the park across from the Xerox Corp. tower after an 11 p.m. official closing time. A Halloween-themed protest was planned for midday Monday outside Bank of America across from the Liberty Pole by members of both the Occupy movement and Band of Rebels, a like-minded group that predates Occupy. City-owned Washington Square Park "is informally, generally recognized by the city as the free-speech park - it's the park here where gatherings begin and are held," said Michael Steinberg, a Rochester lawyer who is a member of Occupy Rochester. City codes prohibit displays of signs, use of megaphones and meetings without a permit at the park, which is about the size of a city block. However, a permit requires assumption of liability "and it's rather difficult for people to agree to that because it would potentially leave them open to all kinds of litigation if anybody is injured through any negligence by anybody who is there," Steinberg said.